Mordecai Children's Garden is designed for children and families to interact with and discover all aspects of plants in a natural and inviting setting. Newly built and planted in 2010, the Children's Garden provides the opportunity to learn about plant life in local ecosystems. Start your adventure at Trailhead Terrace before walking through an alpine meadow similar to what you might find atop the highest peaks in Colorado's high country. Climb the summit of Marmot Mountain and carefully cross the swinging bridge to enjoy views from Pika Peak. Springmelt Stream is a welcoming place for children of all ages to dip their feet and try their hands at building beaver dams. The Mystery Forest and Glorious Grasslands depict the montane and plains areas of Colorado. The adventure continues to Pipsqueak Pond, the Home Harvest Garden and Morrison Discovery Center. Bring your family to explore the fascinations of flora and inspire a lifelong affinity for the nature of the outdoors. Plants in this garden include natives such as the bristlecone pine (Pinus aristata) and Douglas fir (Pseudotsuga menziesii) as well as exotic flowers such as the ice plant (Delosperma cultivars). Many favorites from the Plant Select® program, as well as hundreds of spring blooming bulbs, create color throughout. 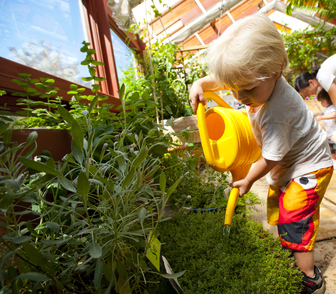 For a list of plants in the Children's Garden, click here.